Właśnie był Dzień Niepodległości w Stanach Zjednoczonych więc dzisiaj zdecydowałem poruszyć temat patriotyzm w USA! Proszę podaj mi poprawki do tego filmiku w serwisie Lang-8. Oto jest filmik na temat Deklaracji Niepodległości, o którym mówiłem. The biggest April Fools' Day hoax! Today is April Fools' Day! A day when people play tricks on their friends who may have forgotten to check the date in the morning. Even a few organizations join in the fun! Many newspapers, television stations and internet sites (like Google) have pulled April Fools' Day pranks, including the famous BBC spaghetti tree hoax. On April 1st, 1957, an estimated 8 million people watched the 3 minute report on television. In the 1950s, spaghetti was not an everyday food in Britain and few people knew how it was produced. Watch it yourself in the following video! Dzisiaj mówię krótko na temat alkoholu i Sylwestra w Stanach i potem pokazuję to, co nagrałem na Sylwestra. Mam nadzieję, że to jest ciekawe! Dzisiaj mówię na temat Bożego Narodzenia w Stanach Zjednoczonych i trochę pokażuję, jak moja rodzina obchodzi to święto. Też mamy "tajemnica", z którą potrzebujemy pomocy od Polaków! Proszę obejrzyj filmik i napisz komentarze, żeby nam pomóc! 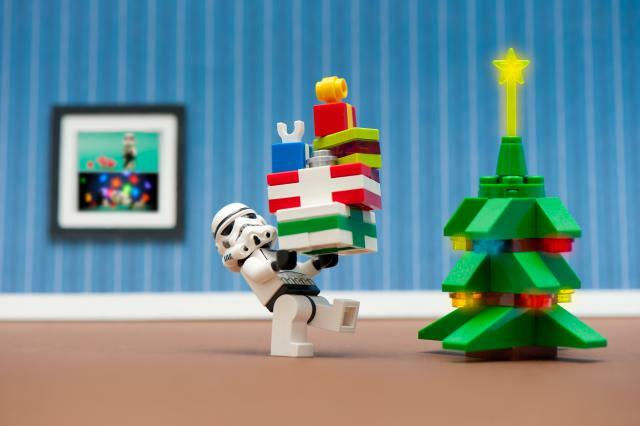 The Empire is stealing Christmas! Photo by Kenny Louie. For Christians, Christmas is about celebrating the birth of Jesus. However, according to a recent poll, 95% of Americans celebrate Christmas, including 80% of non-Christians. But for both believers and the rest of us, Christmas in the USA is about spending time with family and friends. Yeah, family and friends, but also -- PRESENTS! Glorious presents! When I was a kid, I couldn't wait until Christmas. I dreamt of all the great things I hoped I was going to get. It was a magical day, when dreams came true! How can you have Christmas without presents? But a number of years ago, my family stopped exchanging gifts at Christmas.